... developping apps for Android devices. Our apps are available at Google's Android Market. Secret Safe allows you, to store all authentication information (user name and password), as well as PINs (for bank cards, credit cards or other phones), contact data, bookmarks and any text notes securely in your mobile phone's database. The secret information is AES encrypted using a master password, so you have to remember only this master password. In contrast to other password managers, Secret Safe needs no application right for Internet access, it operates only on your mobile and you can be 100% sure, that your passwords and other secrets are kept on your device. Stores all data, you want to keep confidential (passwords, PINs, contacts, bookmarks, notes) in the database of the mobile phone. Nobody can use this data without the master password, even when the phone itself is lost. All secret entries are stored encrypted as BLOBs in a database on the device. The app uses a combination of AES and Twofish encryption with 256 bit keys and multiple and "salted" hash iterations (SHA-256) for the key derivation from the master password. User name / password for logins. For web-based logins a directly clickable URL can be stored. User name and password can be copied to the phone's clipboard, so they must not be retyped. PIN and PUK/PUC information for bank cards, credit cards or SIM cards including notes for emergency cases (e.g. phone number of provider for locking the card). 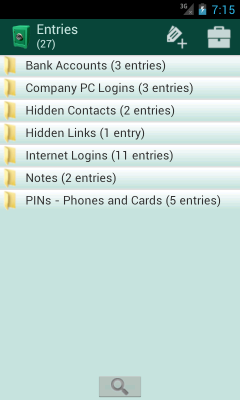 Secret plain text notes, you want to store securely on your Android mobile phone. Bookmarks or other hyperlinks you want to save encrypted. Contacts (email, phone, ...) you want to save encrypted. All entries can be selected very quickly in a sortable list. You can use self-defined categories to structure the entries. A configurable password generator can be used to generate random passwords. Supports 2 different types of backups based on CSV files. The recommended version uses ZIP-AES 256-bit encryption using an additional backup file password. So there is no danger, that someone, who finds your lost phone is able to restore your secret information from the SD card using a card recovery tool. The file can be opened and decrypted on PCs using standard UNZIP programs supporting AES encryption, like WinZip, Power-Archiver or 7-ZIP. The backup file can be SEND directly to a safe storage via bluetooth, email or cloud storage. The backup file is also overwritten on the deletion, so that it cannot be restored on the file system level by recovery tools. On newer Android systems, the application prevents that sensitive data is shown in screenshots for the "recent apps" list. Supports copying of user name and password to clipboard and automatically cleans the clipboard after 30 seconds. Offers a configurable password generator. After 7 unsuccessful attempts, the database is deleted (self-destruction). Has an "Exit" menu on all screens, that finishes the task completely. This is an extra security measure to prevent attacks on the process memory by malware, after Secret Safe was used. Has an inactivity timer. When the app is put into the background for more than 2 minutes, the start screen will be displayed, after the app is resumed. The master password must be entered again to unlock the safe. Includes english, french, spanish, russian and german help pages. The "Lite" version is limited to 8 entries! 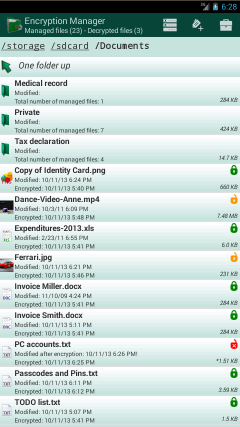 Do you have files with sensitive or confidential data on your Android phone? Are you afraid, what happens when your phone is lost or stolen? Then you should consider using Encryption Manager. Do you install apps on your phone or tablet, that require access rights to read your SD card and also have internet access? Are you afraid, that the developer of the app might have code inside the app that reads files on your SD card and transmits them to his web server for whatever reason? If you really need apps with these kind of rights, you should consider using Encryption Manager for encrypting those of your files, where you can't risk that they are sent to somewhere else. Encryption Manager is a file manager, that offers a comfortable and secure way to keep files with confidential data encrypted using AES or Twofish encryption on the SD card. A master password is both used to access the application and to encrypt the encryption keys, that are generated random for each file, that is managed by Encryption Manager. Confidential files are accessible directly after the login. With one click on the file, the file is is decrypted to its original location and can be shown by the installed viewer or editor apps. When you are finished working with the decrypted copy, the file is re-encrypted with one click and the decrypted file is wiped from the SD card. This wipe process will overwrite the data with random bytes before the file is deleted. So even if the device is lost or stolen, it is not possible to access your confidential data. Access based on master pin or master text password. Encrypts all kind of files and all files of a folder. Provides a special handling for images, e.g. removal/creation of gallery thumbnail images. Base functionality of a file manager (view on click, send/share menu), but with automatic decryption before the action. Offers AES and Twofish encryption with 128 and 256 bit keys. Status tracking: Displays icons to indicate whether a file is currently decrypted or was changed. Backup/Restore of encrypted files on cloud storage (e.g. Dropbox, Google Drive) possible. If wanted, the app will backup only changed files. User setting for automatic re-encryption on exit. Two layout modes: flat list view or hierarchical folder view. Filters can be defined to filter SD card files by file extensions or to excluded folders. The master password can be changed for an existing database. Can be configured to delete all managed files the after 7 unsuccessful attempts. Has an "Exit" menu on all screens, that finishes the task completely. App is locked (master password must be re-entered), when there is no user input for a configurable period of time. Includes english, german, french and russian help pages. The "Lite" version is limited to manage 5 encrypted files! © 2011-2017 GiraOne - All rights reserved.